Beautiful day and perfect flying weather - enough wind for easy launching with soft, gentle thermals. Flew over from Cumnor, expecting to join loads of folks out for a Saturday evening flight and pint, but just one red Synthesis in the air, which I guessed must be Stephen or my God Brother, Pete. Flew low and saw Pete's Suzuki in the nicely mown LZ. Landed and so did Pete who shook my hand and topped up my fuel for the flight back to Cumnor. Didn't need it as air above 2000' had so much lift I was on tickover all the way home. Could this have been restitution (aka magic air)? 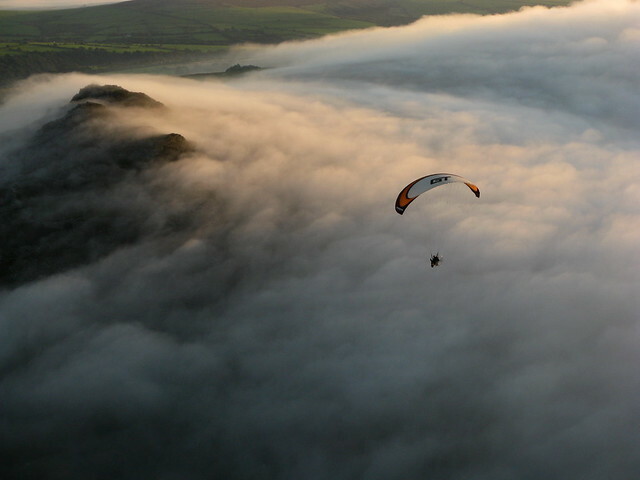 Here's a pix Pete took of me when we were flying in Wales... that was magic!